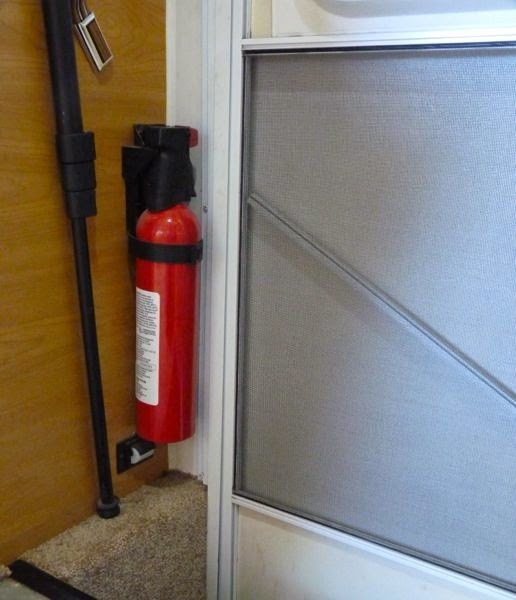 One improvement made to the RV was to upgrade the fire extinguisher. The typical dry-chemical type that came with the rig was old and of little use. So, it was replaced with several foam type positioned in strategic spots inside the RV. A large one replaced the standard unit by the entry door. Small ones were placed by the driver seat, in the galley away from the stove, in the lounge where I normally sit, and in the sleeping loft within easy reach. All are quickly accessible for an emergency. These units are good for about 5 years, so need to be replaced by the expiration dates. A fire in an RV would spread very quickly. So, having fire extinguishers positioned for quick access and of the correct type is essential. And, having several insures there will be plenty of fire fighting foam to extinguish a blaze. The new foam type are easier to use, more effective on fires likely in an RV, and don’t require hazmat clean-up after a fire. See the excellent write-up by Andy Baird in his Eureka! for RVers. 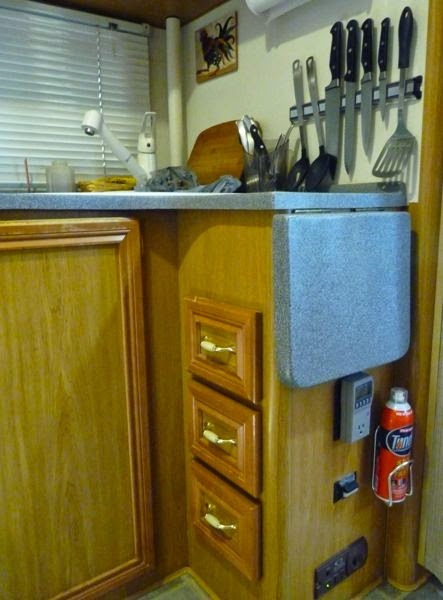 Foam fire extinguishers along with proper alarms for propane (near the floor), smoke (ceiling near the galley), and carbon monoxide (eye level by the loft) should go a long way toward providing fire safety in my motorhome Tardis. A fire in an RV is a scary and very dangerous thing. My diesel pusher only has one door and it is up beside the passenger seat. There are a couple of windows that are suppose to push out easily, but I doubt if my wife could open one to get out. You have the right idea with all the extinguishers placed in strategic places. I hope it is enough to stop a blaze quickly. Escapes do need to be tested, so you will be prepared. It’s a good idea to do a practice run through. Thanks for commenting. Thanks for the input. The power cord entry is under the stove and only accessible from inside; so, I think the galley one will do for it. I have seen more than one go up in flames….You have mere seconds, and I’m not kidding. Seconds is true; which is why I have them within easy reach wherever I am in the RV. The small foam ones are good because they provide a quick response. It would be wise to add them to your check list when preparing a for a trip. Thanks for reading.